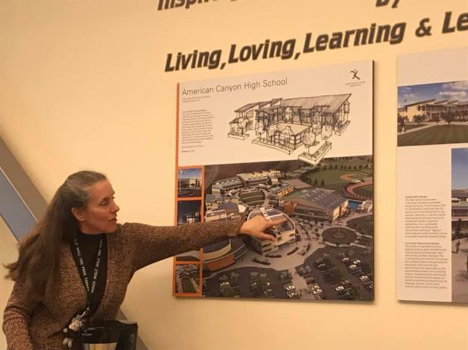 “American Canyon High School is hosting Community Learning Walks for business and community members so locals can see our campus, experience our programs, and meet staff. 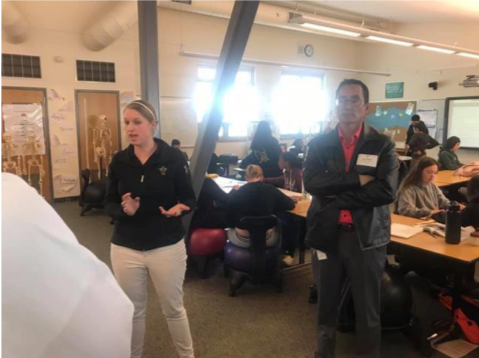 We believe that building a bridge between our community and school will inspire opportunities for our students and businesses to work together on a regular basis.” Says Beth Goff, American Canyon High School Teacher/ ACCC Board Member/ Napa Valley College Board of Trustees. 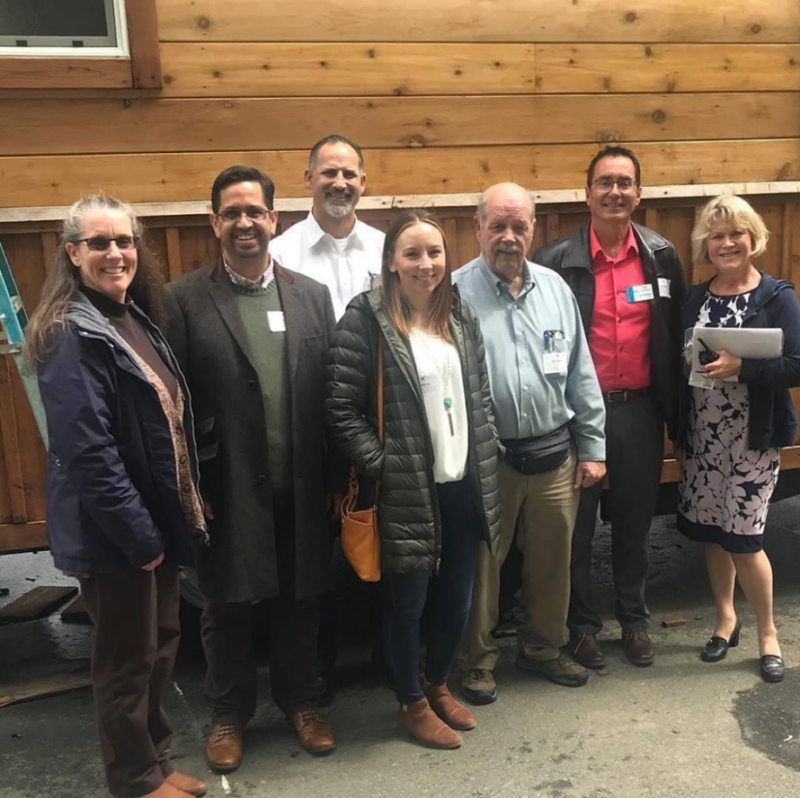 The first of a series of four Community Learning Walks was held on Wednesday, April 2nd. 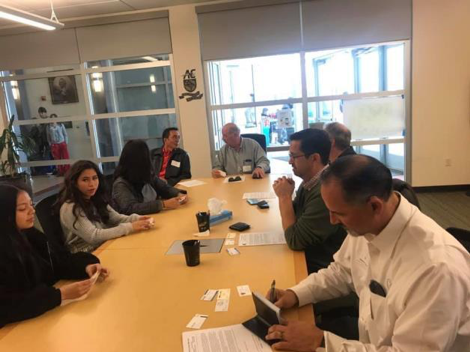 Our group included representatives from Recology, G3 Enterprises, Valley Wine Warehouse, American Canyon Chamber of Commerce and Nelson Staffing. Our tour began with lunch with a few students and administration. 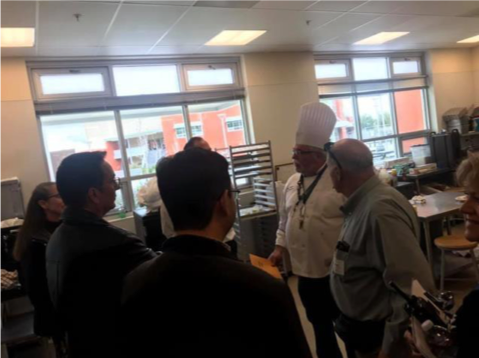 Lunch was provided by the American Canyon High School Culinary Club. It included a beef stew, Cornish hen and strawberry shortcake for dessert. The food was fantastic! Beth Goff gave an overview presentation of the high school, which included a background of the technology that is behind the scenes from smart lights to solar panels. After lunch, Beth began our tour in the theater where we observed a class in action and even caught some students practicing for the upcoming play! Then we entered the band room and enjoyed music played by the chamber orchestra. We took a sneak peek at the biotechnology laboratory and ceramics class. Then we landed in the Construction Career Technical Education Class and were able to explore the tiny house the class is working on. From there we watched the Chemistry Class explode some sodium for us and toured the Athletic Training Career Technical Education Classroom while the students worked on their projects. Our group also spoke with some of the students in a Humanities 11 class. After seeing the library and NVC classrooms, we ended our tour in the Digital Media/ Robotics Classroom just missing the Digital Media Class! We can be change makers. We can influence this generation and help them choose a career path to follow. We can show them what our businesses offer and the opportunities they have in their hometown. It all begins with exposure. Our students and many residents are not aware of the businesses in town, other than those along the HWY 29 corridor. Pop into a class as a guest speaker, host a booth at the ACHS Career Day, or judge a Business Plan Competition. When we enter their world, we leave traces of us and our influence behind. By showing them our businesses and career opportunities, we open their minds to the possibilities of their future. There are three more Community Learning Walks – April 24th, May 1st, and May 15th. We encourage everyone to sign up for this opportunity. You won’t be disappointed!